Recent times have seen an increased interest into techniques that allow the linking of records across databases. The main challenges of record linkage are (1) scalability to the increasingly large databases common today; (2) accurate and efficient classification of compared records into matches and non-matches in the presence of variations and errors in the data; and (3) privacy issues that occur when the linking of records is based on sensitive personal information about individuals. The first challenge has been addressed by the development of scalable indexing techniques, the second through advanced classification techniques that either employ machine learning- or graph-based methods, and the third challenge is investigated by research into privacy-preserving record linkage (PPRL). 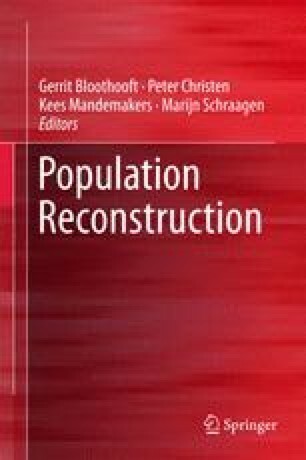 In this chapter, we describe these major challenges of record linkage in the context of population reconstruction. We survey recent developments of advanced record linkage methods, discuss two real-world case studies, and provide directions for future research. The authors would like to thank Mac Boot (The Australian National University) and Vassilios S. Verykios (Hellenic Open University) for their contributions to the work presented in this chapter.